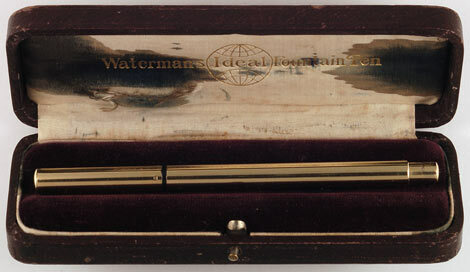 11833: Waterman 16: slip-cap clipless eyedropper-filler, 13.6 cm long, big and early, rounded ends, two-line pre-globe barrel imprint, cap imprint with 1898 patent date, early nib imprint, Spoon Feed with bold 1899 patent date, no 1903 date. Cap imprint shows polishing wear, barrel imprints fine, nib has a couple of stress cracks from the vent hole, barrel has a few pit marks, perhaps from sparks, overall appearance excellent. 12960: Waterman 412: black hard rubber eyedropper-filler, .999 fine silver Art Nouveau filigree overlay, 13.2 cm long, feed with patent imprints, imprints on overlay unusually clean and well-preserved; moderate fading to hard rubber, one shallow bump to cap crown, early filigree pattern. 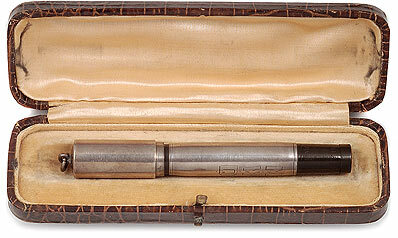 10571: Waterman 0502: black hard rubber straight-cap eyedropper-filler, gold filled overlay in "Golpheresque" pattern, 13.4 cm long; unusually clean condition, metal crisp with initials engraved on barrel, imprint on side of posting end of barrel with a couple of scratches just above, no model number imprint at end; long-tailed spoon feed with patent imprint. 9133: Waterman 322 Commercial: black hard rubber taper-cap eyedropper-filler, solid 9K English-hallmarked barrel overlay, 14.6 cm long; pre-Globe cap imprint worn but fully legible, seam split at front of overlay rewelded (see details); long-tail feed with patent imprints, early slender #2 New York nib. 11608: Waterman 0502 in box: straight-cap black hard rubber eyedropper-filler with uncommon smooth gold filled overlay, 13.4 cm long, made for the French market, "DOUBLÉ OR" hallmarks, 18K gold #2 New York nib. No dings, test marks to cap overlay rim (see detail), posting end imprint has caused some plating loss (die too sharp? ); nib is long-tined, soft and opens up easily with only slight pressure, has been retipped. 10952: Waterman 612: black hard rubber slip cap eyedropper-filler with pearl slabs on barrel, smooth gold filled barrel bands; 13.5 cm long, moderate even fading to hard rubber, #2 New York nib opens up easily with minimal pressure. Cap is not imprinted, may be a slightly later replacement. Pearl-slab Watermans are not common, and nearly all are taper-caps. This is only the second pearl-slabbed Waterman cone cap we have had in over 15 years. 12173: Waterman 522: black hard rubber eyedropper-filler taper-cap, full London-hallmarked 9K solid gold fine barleycorn overlay, 15 cm long, patent imprint on feed, early imprint on #2 New York nib, no number on end of barrel as is usual for English-marked Watermans; overlay is crisp, initials engraved in barrel cartouche, slight seam opening (see details). 9753: Waterman 512½ Colonial: slender black hard rubber eyedropper-filler, 12.1 cm long, solid 14K gold overlay in scarce fine parallel lines pattern, especially rare with factory cabochon at cap top; elegantly engraved monogram on barrel, minor bump marks to cap, overall nice and clean, smooth and responsive #2 New York nib. 13631: Waterman 0502: gold filled "Chased" pattern eyedropper-filler, 13.3 cm long, posting end has usual scratches from cap but "WATERMAN" imprint clearly legible; spoon feed with patent imprints and long internal tail, tail end chipped, section front edge as well (does not affect function), "Vivian" engraved in barrel cartouche. 13116: Waterman 0512½ VP: uncommon vest-pocket screw-cap eyedropper-filler with smooth gold filled overlay, 10.5 cm long, crisp imprints on hard rubber, elegant monogram engraved on barrel, #2 New York nib. 12565: Waterman 412 Filigree: rare sterling silver filigree overlay over red hard rubber eyedropper-filler, 13.2 cm long, good sound example, name engraved in barrel cartouche, scratches on section, dings to cap crown, but no cracks and nice original condition. #2 New York nib has long tines and is capable of flex, but requires considerable pressure to open up. 12440: Waterman 0512 Filigree: black hard rubber slip-cap eyedropper-filler, gold filled overlay, 13.6 cm long, initials "A.G.C." engraved on barrel, lively and responsive #2 New York nib, cap dome is more yellowish in tone than the rest of the overlay. 12468: Waterman 76: uncommon oversize woodgrain mottled hard rubber screw-cap eyedropper-filler, 13.5 cm long, gold filled trim; imprints deep and bold, hard rubber is like new, crisp and glossy, big #6 nib is a wet writer, has a tiny crack from the vent hole (see details).